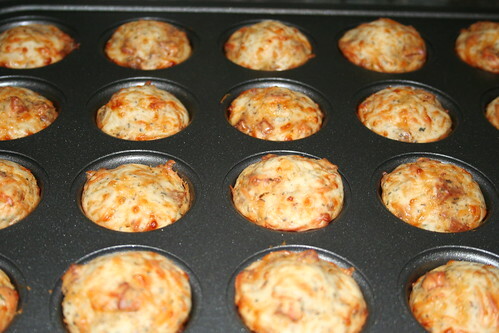 I was feeling rather sassy today and decided to whip up some pizza bites for lunch. Saturday lunch is usually a time I feel really uninspired. A lot of times we’ll just munch around on little things, or else we’ll do a sandwich or something else equally boring. Well, not today my friends! Today we feasted on Pizza Bites. They were easy. REALLY easy. The most time consuming part of this recipe was cubing up the pepperoni, and that took all of 5 minutes. 1. Preheat the oven to 375 degrees. 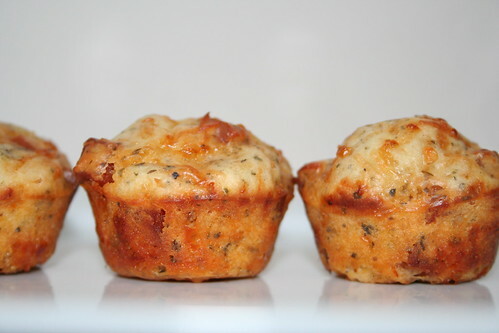 Grease a 24-cup mini-muffin pan. 2. In a large bowl, whisk together the flour, baking powder, Italian seasoning, and salt. Whisk in the milk and egg. Stir in the mozzarella, parmesan and pepperoni. 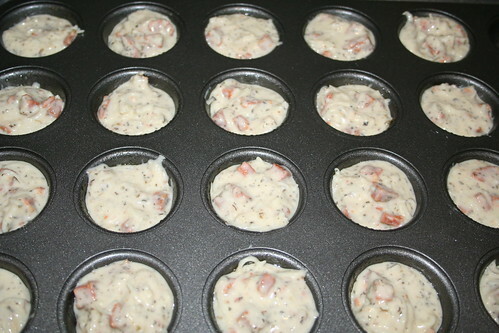 Let stand for a few minutes, then stir the batter and divide among the mini-muffin cups. 3. Bake until puffed and golden, about 20 minutes. 4. Meanwhile, microwave the pizza sauce until warmed through. Serve the pizza bites with the warmed sauce for dipping. Such a perfect lunch to eat on the first full day of the Olympics! I’m so doing this! Yummy!